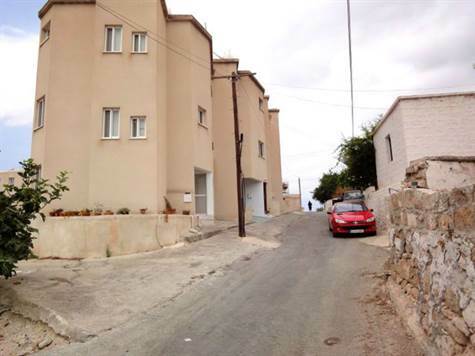 Peyia, Paphos - This impressive 2 bedroom terraced house is located in the traditional part of Peyia vlllage within easy walking distance to the local shops and amenities. Stairs leads up from the entrance foyer to the main living space, which is well designed with a comfortable lounge, dining area, kitchen and cloakroom. Built-in cupboards in the dining area provide additional storage space. Patio windows in the lounge open on to a good size balcony with table & chairs and gas barbacue. The sea views from here are absolutely stunning and it is an idyllic place to enjoy outdoor dining and watch the beautiful sunsets. Upstairs there are two double bedrooms with fitted wardrobes, and a family bathroom. The master bedroom also has patio doors providing easy access to a private balcony with the same fabulous views as below. At the ground level is a large garage with a purpose built workshop/storage room at the rear and a utility and storage room to the side. The workshop can easily be opened up to make a third balcony/outdoor space if required. The property is ideal for permanent living or holiday use. It is being sold fully furnished and has full title deeds. There are no communal fees.